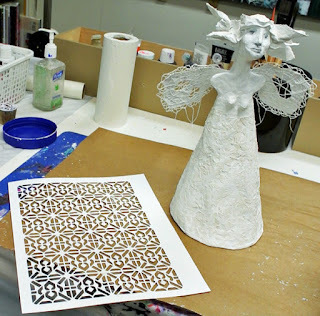 StencilGirl Talk: Who Can’t Use A Guardian Angel? Who Can’t Use A Guardian Angel? Hi, everyone! Carol Wiebe here! 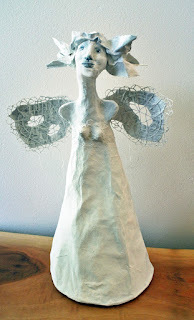 Last June, the StencilGirl Club Reveal showed a winged sculpture that I created. A succinct description of the process followed, and I am going to elaborate on that now for those of you who might be interested in trying your hand at creating such a “guardian” for yourself. 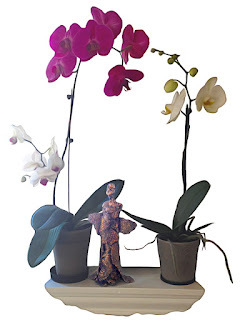 It all began with a gift my sister, Barb Pearson, gave me. 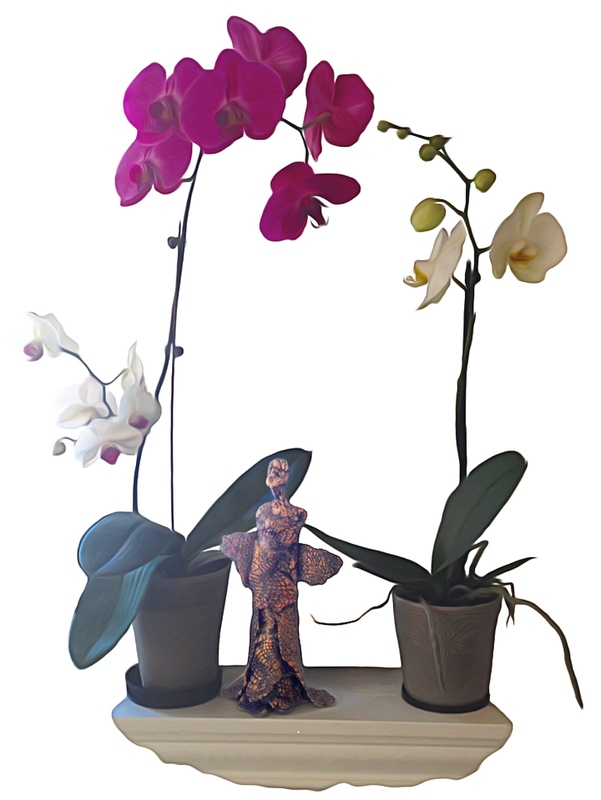 It was a clay angel, which I placed in a place of honor among my orchids on the windowsill. 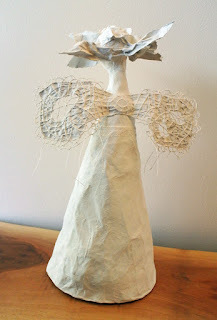 It quickened a desire in me to create my own angel. I grabbed scissors, some old newspapers, a roll of masking tape, and a small piece of cardboard. I estimated the size of the base for my figure and cut it out of cardboard. 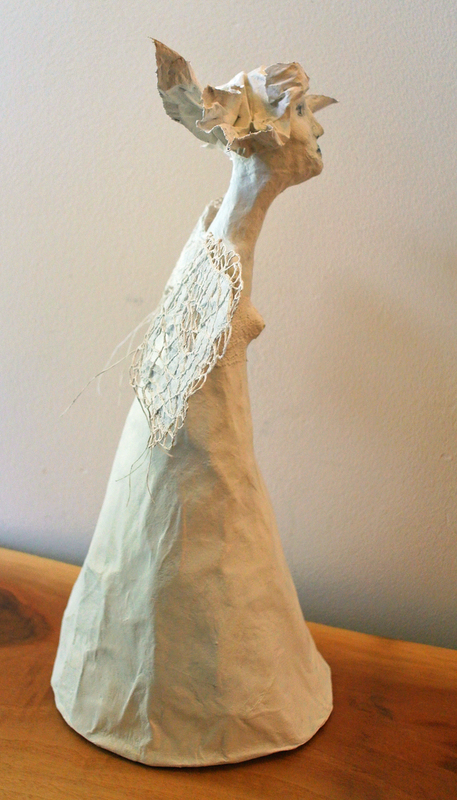 Then I started shaping the figure. 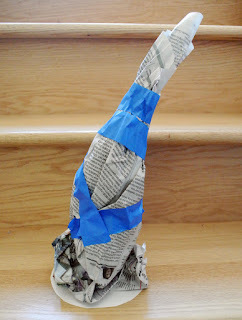 This was done by crumpling and/or rolling newspaper and putting these components in place until I achieved the shape I wanted. 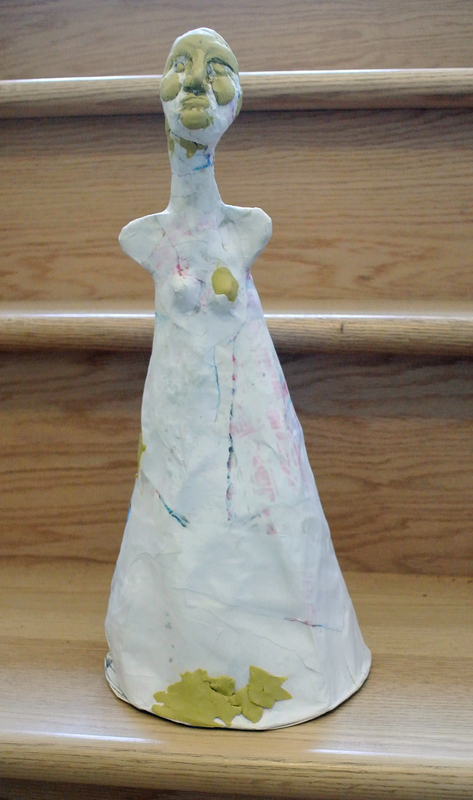 The masking tape both kept the paper in place and was then used to cover the entire figure later. 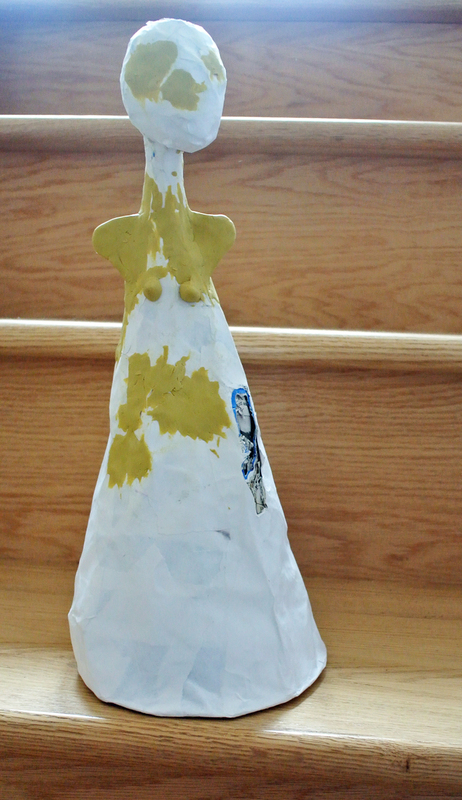 You can see that I made a simple cone with an elongated top that became the neck. The head was simply crumpled paper, rolled into a ball. Some people find it easier to make a round shape out of crumpled tinfoil. 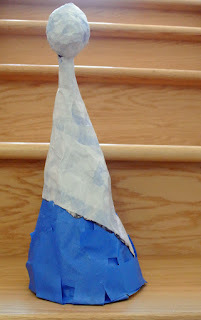 I covered the masking tape layer with several layers of copy paper strips. I tore rather than cut these strips, because the torn edges are softer and blend better. 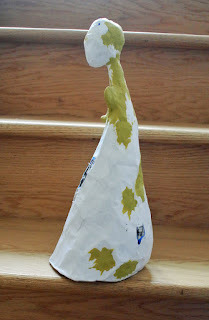 I glued them all over the masking tape covered form, using acrylic gel medium as my adhesive. I added details with plasticine. One could also use “Creative Paper Clay”, or whatever kind of clay works well for you. The details must then be covered with more of the copy paper strips, using gel medium as your glue. I have been using plasticine for decades, with no ill effects. 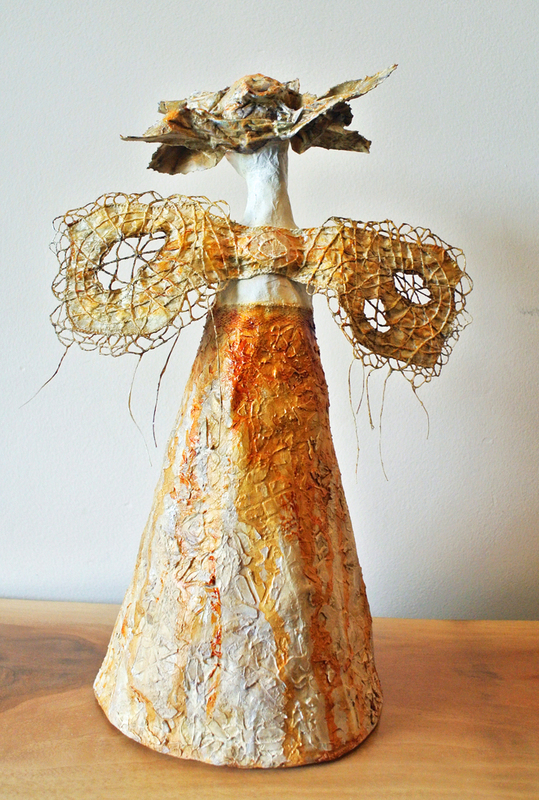 It simply stays inside the papier mâche, like a lost form. The plasticine is stiff enough to allow me to shape it and cover it with paper, and I do not need to wait for it to dry before I do this. You can also see where I cut away an irregular area in the figure that stuck out too far. That could then be repaired with copy paper and gel medium. You may have noticed that at this point the head looks different than it did before. 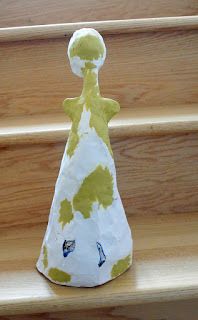 I decided it was too big and not the right shape, so I removed it from the figure, shaped a new one, and papier mâched it on. 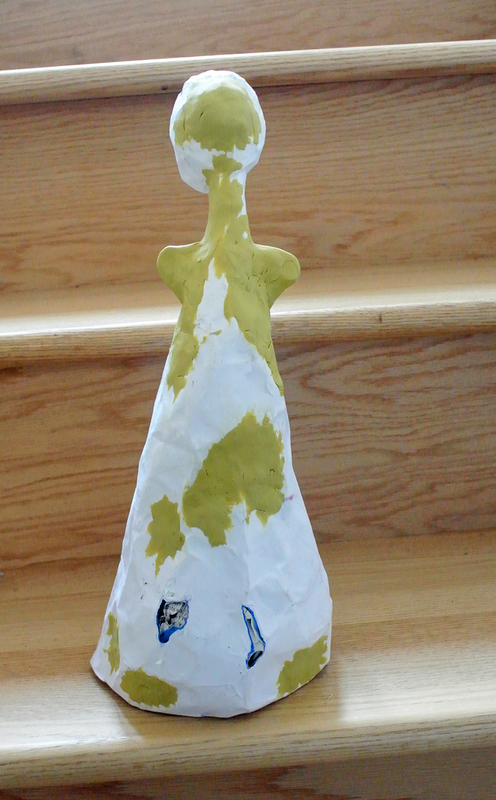 Once the new head was in place, I added facial features, again with plasticine. I finished the head with glued paper strips over the face. The wings were very much fun to create. I cut a shape out of brown paper bag paper, and commenced to stitch all over it. When it was finished, I applied acrylic gel medium over the entire thing. I attached this set of wings to the middle of my figure’s back. 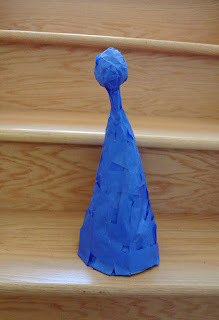 I made the headdress by twisting and shaping pieces of copy paper and holding them in place with glue. Once the pieces were dry, I could thinly gesso them to add strength, and then add more gel medium when the gesso was dry. 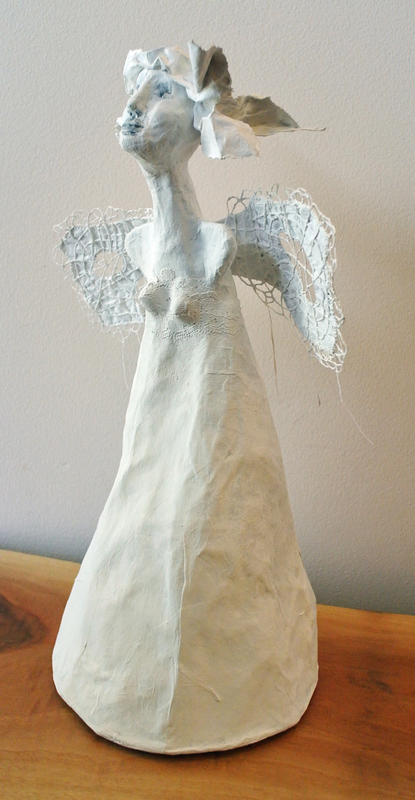 I finally had the angel all finished and painted with gesso. In this pic you can also see the bit of lace I glued on for the bodice of the dress. At this point, use of a stencil finally came in! I picked my 9x12 Floral Facets stencil from the StencilGirl Club because it has a brocade look that I wanted to achieve on the dress. As a bonus, it would also cover any irregularities I might have missed. I balanced my angel in a container and opened up a tub of Acrylic Pro. Acrylic Pro is a ceramic tile adhesive, so if you cannot find this brand, I am sure another adhesive of the same kind would work. 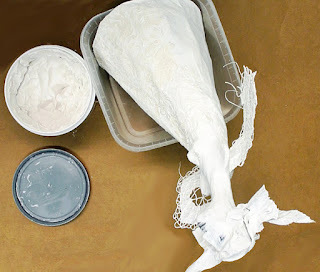 So would extra heavy gesso or molding paste. I then proceeded to hold the stencil against the parts of the dress that I wanted to texture, and applied the paste with a palette knife. This must be done in stages, as you will crush some areas that are not yet dry when you move the angel around. You cannot, for instance, do the front and then immediately do the back. Perhaps this could be achieved on a lazy Susan! 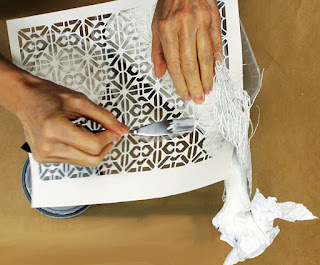 Make sure you clean the stencil each time you put a material through it that dries so hard, or you will ruin the stencil. When all was said and done, I decided against a pure white angel, and painted her with one of my favorite colors: Golden’s Nickel Azo Gold. This is a paint splattered note that I wrote a phrase onto as I was working on the angel. “Those who rely on arms can never know the disarming power of vulnerability.” When I saw the note later, I thought of the fact that my angel had no arms, only wings. That made her very vulnerable. But vulnerability is disarming: it catches others unawares, lets them know how “human” you are, how imperfect. And allowing that vulnerability makes meaningful connections with others. You are not someone to fear, someone threatening. Rather, you are someone others can feel safe and unguarded with. Perhaps that was the angel’s message to me, that I shouldn’t be afraid to be vulnerable. Carol I am totally blown away with your angel and She has completely disarmed me! She's absolutely wonderful. Carol, after having a particularly trying day, I sat down and finally opened the post to read it. The title Gaurdian Angel immediately spoke to me. It was as if I was being told, "it's going to be ok". What a beautiful project. 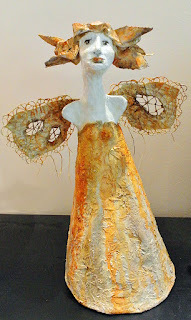 Your Angel feels vulnerable and peaceful, she is a giver of light.